TORONTO, Oct. 19, 2017 /CNW/ - RNC Minerals (TSX: RNX) ("RNC") is pleased to report continued high-grade drill results at depth from underground drilling at its Beta Hunt Mine in Australia. Underground definition drilling continues to infill and target down-plunge extensions of the A Zone and Western Flanks gold system, and increase mineral resource confidence. Mark Selby, President and CEO of RNC Minerals commented: "Our exploration results continue to successfully test our theory of increasing grade with depth beyond the current resource. These most recent results highlight the scale and grade potential of the Beta Hunt gold resource. This first discovery of high-grade gold specimen mineralization well below the gold contact in the A Zone provides further support for the resource potential of this mine. We will continue to release results as our drilling program advances. We look forward to producing an updated resource in 2018." Since RNC's news release dated September 5, 2017, 50 holes have been completed for a total of 4,843 m. The gold systems continue to return intervals of high grades with visible gold. Continuity of gold mineralization in the A Zone has now been defined over a strike extent of 400 m and vertical extent of 250 m. Recent drilling confirms that higher-grade gold mineralization extends approximately 200 m laterally to the south and 60 m below the current mining zone. Gold mineralization has been extended at Western Flanks over a vertical extent of 60 metres and laterally over 200 metres with multiple drill hole intersections containing greater than 20 metres of mineralization. 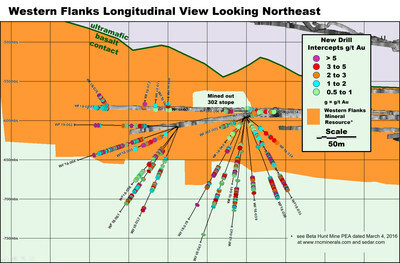 Drilling highlights in Western Flanks are outlined below in Table 1a (See Table 2 for full assay results). True widths have not been determined at this time. Results of the ongoing underground resource drilling program at Beta Hunt continue to demonstrate continuity along strike of the A Zone gold system. Key intercepts are listed below in Table 1b, with further details provided in the commentary that follows (See Table 2 for full assay results). Infill drilling of 14 holes was completed (total of 941 m) from 13 level in A Zone, extending the mineralized zone along strike and yielding multiple thick, high grade intersections. In the month of September, development crews working in A Zone on 14 Level encountered specimen stone (natural gold nugget specimen), located along a sediment contact. This represents the first time RNC crews encountered specimen stone this far below the ultramafic contact. The geology team is investigating other potential areas where specimen stone could be found at depth within the A Zone. A total of 100 oz of specimen stone was sold in October, most of which came from the 14 level. The technical information in this news release relating to results at the Beta Hunt Mine is based on information reviewed by Steve Devlin, who is a Member of the Australian Institute of Mining and Metallurgy. Mr. Devlin is a full time employee of Salt Lake Mining Pty Ltd and has sufficient experience, which is relevant to the style of mineralization and type of deposit under consideration and to the activity which he is undertaking to qualify as a Competent Person as defined in the 2012 edition of the "Australasian Code for Reporting of Exploration Results". Drill core sampling was conducted by SLM personnel. Samples are shipped to SGS Mineral Services of Kalgoorlie for preparation and assaying by 50 gram fire assay analytical method. First sample of each sample submission incorporates a barren rock sample as a flush to clean the lab crusher and pulveriser and as a check for contamination. Analytical accuracy and precision are monitored by the analysis of insertion of additional blank material and certified standards. The lab is also required to undertake a minimum of 1 in 20 wet screens on pulverised samples to ensure a minimum 90% passing at -75µm. The disclosure of scientific and technical information contained in this news release has been approved by Kevin Small, Director, Mining Operations of RNC, a Qualified Person under NI 43-101. RNC is a multi-asset mineral resource company with a portfolio of gold and base metal production and exploration properties. 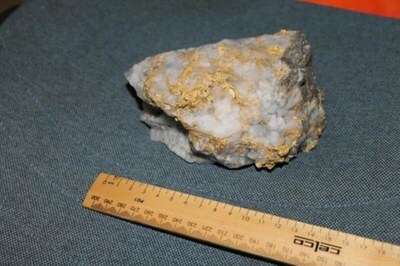 RNC's principal assets are the producing Beta Hunt gold and nickel mine in Western Australia, a 50% interest in a nickel joint venture with Waterton that holds the Dumont Nickel Project in the Abitibi region of Quebec, and a 30% stake in the producing Reed Mine in the Flin Flon-Snow Lake region of Manitoba, Canada. RNC also owns a majority interest in the West Raglan and Qiqavik projects in Northern Quebec. RNC has a strong management team and Board with over 100 years of mining experience at Inco and Falconbridge. RNC's common shares trade on the TSX under the symbol RNX. RNC shares also trade on the OTCQX market under the symbol RNKLF. This news release contains "forward-looking information" including without limitation statements relating to the liquidity and capital resources of RNC, production guidance and the potential of the Beta Hunt Mine. Forward-looking statements involve known and unknown risks, uncertainties and other factors which may cause the actual results, performance or achievements of RNC to be materially different from any future results, performance or achievements expressed or implied by the forward-looking statements. Factors that could affect the outcome include, among others: future prices and the supply of metals; the results of drilling; inability to raise the money necessary to incur the expenditures required to retain and advance the properties; environmental liabilities (known and unknown); general business, economic, competitive, political and social uncertainties; accidents, labour disputes and other risks of the mining industry; political instability, terrorism, insurrection or war; or delays in obtaining governmental approvals, projected cash costs, failure to obtain regulatory or shareholder approvals. For a more detailed discussion of such risks and other factors that could cause actual results to differ materially from those expressed or implied by such forward-looking statements, refer to RNC's filings with Canadian securities regulators available on SEDAR at www.sedar.com.